This is a recipe from my good friend and longtime co-conspirator Ashley, who is a great cook and sometimes posts recipes here. 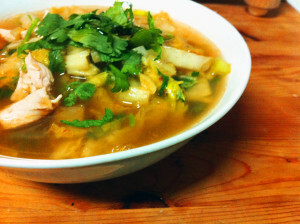 Â Some years ago when I was feeling pretty under-the-weather, she shared with me this recipe for a soup that she created. This is totally comfort food, for me, when the cold weather hits; it’s essentially a Chicken Noodle Soup, if Chicken Noodle Soup wasn’t salty, bland, and disgusting and was instead somewhat heavenly and delicious. Anyway, now you know where I stand on Chicken Noodle Soup. Â This recipe will do all of the things you want from said grotty soup, but will do them with vim, vigour, and panache. I’ve put it in here as Ash sent it to me, so most of the words (and 100% of the credit) are hers. “This is based on a recipe I found online several winters ago. It’s also pretty good with tofu and veggie stock, [Tried it, liked it. Candace] and it would probably be awesome with beef/beef broth and maybe rice noodles. I find the cabbage-garlic-buckwheat interaction in the chicken version extremely nourishing, and a relief for when it’s time to go back to eating food with flavours. Quickly! Add the cabbage and green onions! Really, it’s probably done now. Check a piece of chicken to be sure. Stir in the noodles, cook until they’re soft, remove from heat, and stir in the cilantro and lime juice.